Spring and Summertime cookouts are a great way to entertain this season and the convenience of a backyard grill offers a healthier way to cook all year round. Just a couple of dos and don’ts will yield fabulous results. 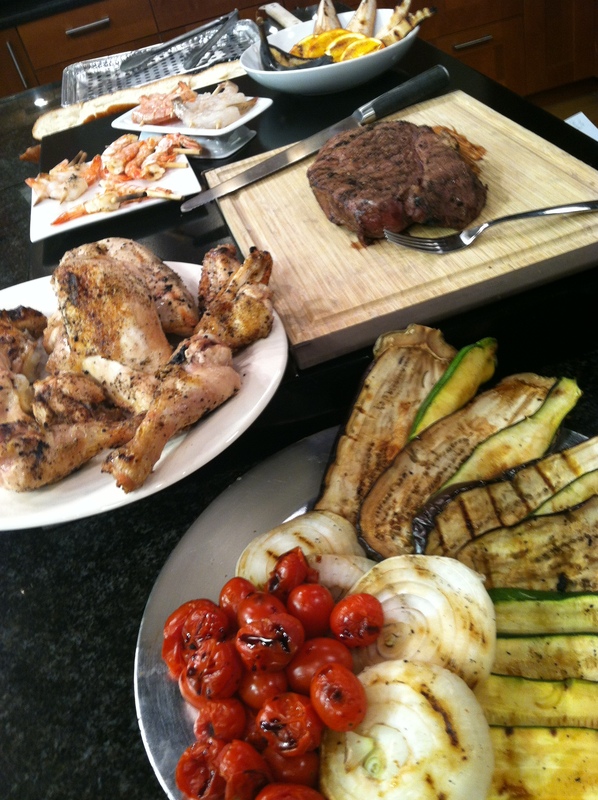 As many of you might realize, this post coordinates with a cooking tip segment originally aired on WCNC’s Charlotte Today on Tuesday May 20, 2014 – Click here for the link to the video. Everything I talked about on air and more follows in this post – enjoy! And, so that you can put these tips to action right away I’ve also included one fun seasonal recipes at the end – its homemade ice cream to serve with a bevy of fresh fruit hot off the grill. 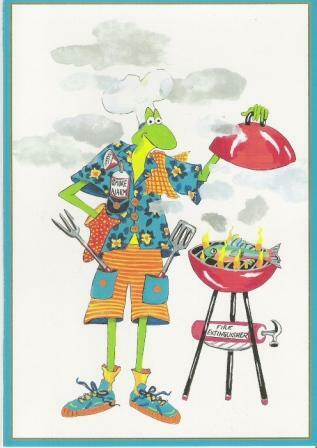 But, before dessert, my good-to-grill tips – just one quick read and you are on your way to getting your grill on for 2014! 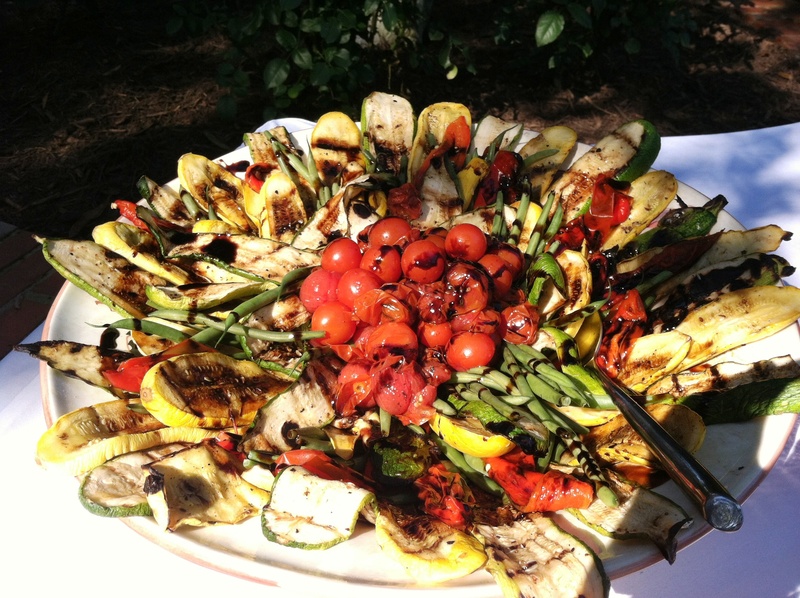 First and foremost – don’t place oil-laden foods on a hot grill. Oil ignites and will burn quickly, so marinate to your heart’s content, but before placing food on a hot grill, pat it dry first, and then cook. Vegetables and fruits grill perfectly fine without the addition of any oil at all. Just salt and pepper and perhaps place smaller things on a non-stick grill grid for perfect results every time. Do grill chicken, but don’t feel you need to boil it or microwave it first – it will cook perfectly from beginning to end if you follow a few easy steps along the way. Start by grilling pieces (with or without the skin attached), simply seasoned salt and pepper – I suggest using my favorite coarse pink Himalayan sea salt and my special pepper blend from the Savory Spice Shop in Charlotte’s SouthEnd. Place the chicken on the grill skin side up, boney side down. This will help to help render the fat. By the time you turn the poultry, the fat has cooked down affording less opportunity to flame up. If a piece does start to flame, just take it off the grill and get it out of the way. Do not douse it with water – you will just make a bigger mess. Don’t marinade raw poultry (or any other meat) in barbecue sauce as the sugar in the sauce will burn on the grill long before the chicken, pork or beef is cooked inside. Instead, do salt and pepper your favorite cuts and grill on each side over a low to medium flame to cook through and brown slightly – about 4-6 minutes on each side. Then baste the top of each piece with sauce, close the lid of the grill and allow the sauce to cook for 2-3 minutes before you flip. Repeat with the other side. 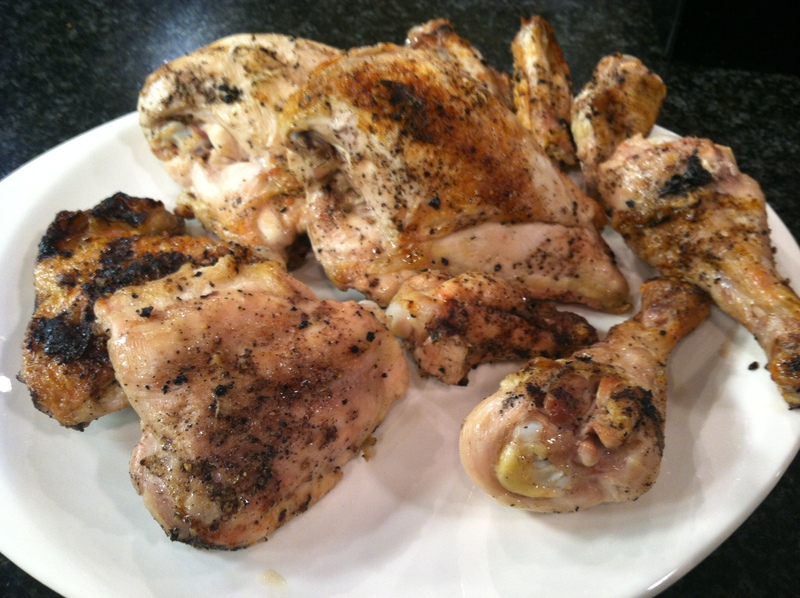 Results will cook up tender, juicy – not charred – barbecued meats and poultry every time. Grilling a whole chicken is a whole other story, so I’ll save the details on that for a future blog post or a future segment on the Charlotte Today broadcast. For fish, use the Canadian rule. That’s ten minutes of grilling time for every inch of thickness when you measure the fish fillet or steak at the thickest part. Make sure that the fish is not frozen when you start for best results. Turn the seafood once during the cooking process. The exception to this rule is shrimp and tuna steaks. Most people like their tuna raw to rare in the middle and seared on the outside, honestly its probably easier to do this indoors in a hot sauté pan with a little high quality extra virgin olive oil or your favorite sesame oil; but it works on the grill too. Just season with salt and pepper and place the steak on a hot grill for a minute or so on each side. 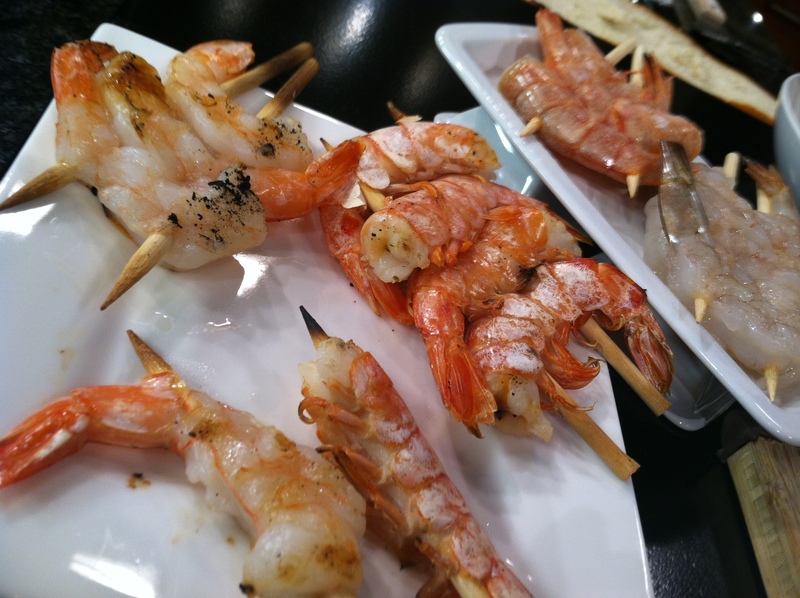 For shrimp, use small thick wooden skewers for best results – soak them in water if you would like, but the truth is if the skewers are thick enough, its so fast that they won’t burn in the time it takes the shrimp to cook. Skewers a servings worth of shrimp at a time – 4-6 in each set and use two skewers instead of just one. This keeps the shrimp flat and easier to turn over with the simply flip of a spatula. You may grill them in or out of the shell – or for a fun hors d’oeuvre you may run a skewer up through a single shrimp and grill it that way then serve with a sauce for dipping – who wouldn’t love shrimp on a stick? Do season beef and pork with a coarse-grind sea salt or Kosher salt to add flavor but not dry out the meat as finer ground salts tend to do. Flipping burgers and steaks with a spatula or tongs instead of a fork will help to keep a moist juicy texture as well. You may marinate if you would like. Be sure to pat marinated beef, chicken or fish dry with several thicknesses of paper towels before grilling, remembering that wet product will not brown even on the grill, it will only steam instead. Once marinated meat has begun to brown, you can continue to baste with the marinade as you cook. Once the cooking is done, toss any leftover marinade. Timing depends on your desired doneness. For the perfect steaks – start with 4-5 minutes on the first side then turn and cook 3-4 minutes more for rare, 4-6 minutes more for medium rare and, if you must, 8-10 minutes more for well done. For the perfect London Broil as shown on the Charlotte Today spot – cook it for three minutes over high heat, the turn the meat at an angle to get the look of those professional crossed grill marks and grill for three minutes more. 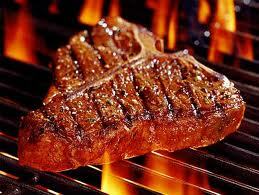 Turn the steak over – with tongs – not with a fork – and repeat the three and three grilling times. Take the meat off the grill; let it rest for 8-10 minutes and then slice at a slight angle. You’ll find the results are perfect and tender every time – with or without the addition of a marinade! Finally, don’t put cooked meat back into a marinade that once held raw meat – the result will be a bacteria hey-day Likewise for putting the cooked product on the same serving platter that once held raw meat or fish. Do use a clean serving plate to bring your grilled goods to the table. For dessert, who doesn’t love a banana split with homemade ice cream? Putting the bananas on the grill adds a richer toastier taste plus its fun to eat your own banana splits right out of the peel! The ice cream recipe is for a basic vanilla. If you’d prefer to add another flavor do it right before churning – fresh strawberries, ½ cup of strong coffee, chocolate chips or crumbled Oreos all work well. To freeze the ice cream without an ice cream freezer, divide the mixture into cupful servings and place each cupful into a pint sized freezer strength zip lock bag. Place the small sealed bag inside one gallon-sized Ziploc bag and then fill the big bag half full of ice and add six tablespoons of rock salt. Seal the bag. Shake for 5-10 minutes or so until the mixture in the small bag freezes and becomes ice cream. 1, Combine the milk and vanilla. 2, Beat the egg yolks and sugar well, until the mix is thick and almost white. 3. Add the milk to the egg mix. Transfer to a large saucepan. Stir the mixture constantly with a wooden spoon over medium heat until the custard starts to thicken. 4. Remove the pan from the heat; add in heavy cream to the custard and blend well. 5. Cool the mix to room temperature and then transfer the mix to the refrigerator to chill it down completely. 6. Pour the cold custard into the ice cream freezer and freeze according to machine instructions.